Welp, I had so much fun two weeks back filling in for Fahey with the Saturday Morning Stream that I decided to do it again. Only this time, with the new Persona fighting game in my hot little hands, I just couldn't wait till Saturday. 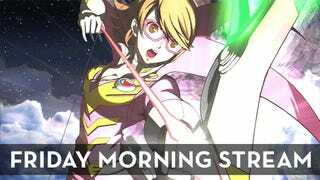 So join me as I play Persona 4 Arena Ultimax live for your pleasure this fine Friday morning. Of course, due to time zone issues, it's actually my late Friday night, so I have an excuse as to why I am so terrible at fighting games. (Seriously though, despite playing them my whole life, no one has ever accused me of being good at them.) But anyway, let's dive into this fighting game/visual novel hybrid which totally should have kept its Japanese title— Persona 4: The Ultimax Ultra Suplex Hold. Edit: Stream is done but can be watched in its entirety below! Enjoy. Persona 4 Arena Ultimax was released in Japan on August 28, 2014, for the PlayStation 3. It will be released in North America on September 30, 2014.